First Saori weaving project underway, Irish Blog Awards and new laptop! After a very, very shaky week things are really turning a corner and looking up at last. At the risk of boring you all to tears I ended last week by getting a bad cold, felt rotten all weekend, had three golf club meetings on Monday and another on Thursday, a major submission for an Arts Grant to complete before three o’clock yesterday, awful problems warping my loom and then HUGE technical problems which resulted in me throwing in the towel and investing in a new laptop this afternoon! Whew, got that all off my chest so onwards and upwards. My loom is now warped and the weaving is well underway. This was the first time that I tried threading 5.5m of warp and for anyone used to weaving this might not be a problem. For me however, it all came apart when the threads leapt off the peg I was using and fell on the floor, panic, panic, panic but I perservered and eventually got the blasted thing completed. Or so I thought! Maybe it was the texture of the paper I used to wind along with the yarn but for some reason I just could not get the tension correct, it appeared to keep getting looser or slipping but to be honest I really don’t have a clue what was happening. Eventually I just decided in the Saori spirit to get on with it, what is free weaving after all if not the freedom to do whatever you want with your weaving? I thought that I would end up having to cut my work into pieces and try wet felting it but after about a metre of weaving the tension is starting to even out and hopefully will be all right for the rest of the piece. I am trying to weave a long, long piece which will then be cut into lengths and sewn together to form a very simple top, pictures and more info to follow tomorrow. My very exciting news this evening is that I have been longlisted for my main blog Clasheen in the ‘specialist’ catagory in the Irish Blog Awards 2010! Thanks so much to catagory sponsors iQ Content and congrats to all the other nominees, it really is a very long longlist! Two days ago I received a fabulous book in the post and I can’t recommend it highly enough! Due to my recent water enforced break from felting I have been trying to get to grips with my Ashford Knitters Loom. Being kind of obsessed once I get my teeth stuck into something (you’ve never guessed!!) 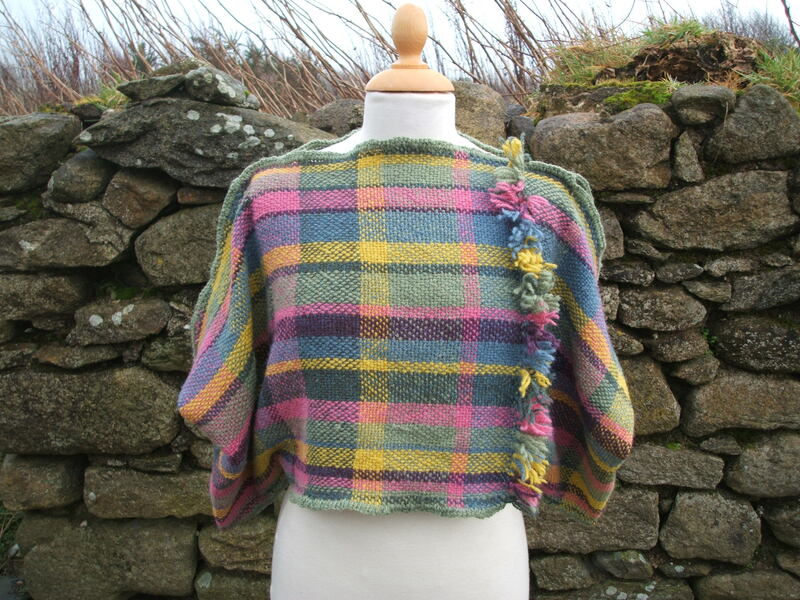 I have also been checking out other weavers work and pictures on Ravelry and Flickr. My eye was totally caught by some pieces in the Saori style so if you really want to see what I consider the woven equivelent of ‘eye candy’ have a look at Terri Bibby’s website and blog! Leading on from this Terri put me in touch with Akiko Jo and now I am the excited owner of the book ‘SAORI Self-discovery through Free Weaving’. 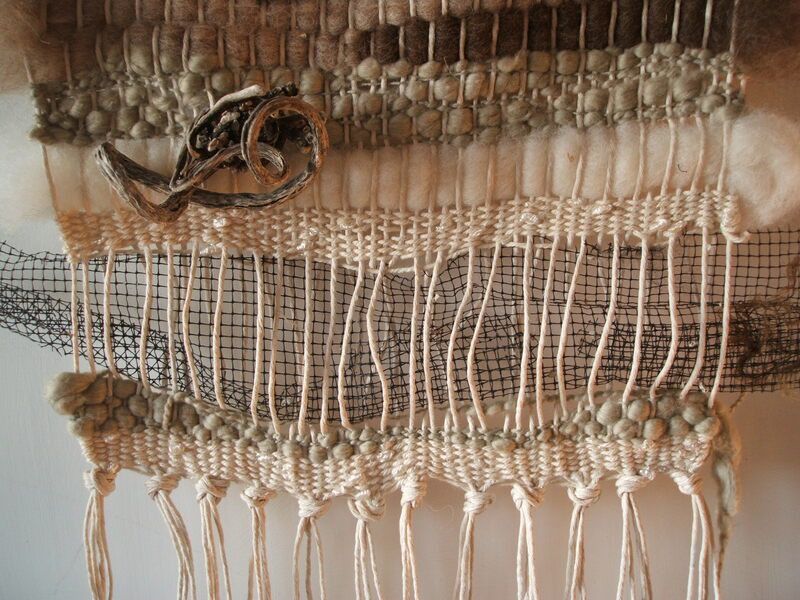 In simplistic terms Saori weaving is an expression of individual thoughts and as much a process as the end result itself. Work is fluid, graceful and exciting and the book gives some fantastic pattern ideas to adapt as wished for simple, funky clothing, I am in love!!! These styles are so totally ‘me’ it really appears to my warped mind (ha, ha) that the book could actually have been written just for me. Using these simple templates I know that I should be able to create some wonderful pieces of wearable art combining nuno felt and weaving, watch this space! If anyone in Europe wants to order the book contact Akiko Jo or if you are living in USA or Canada I am sure that Terri will be glad to help you. It cost me under E30 including priority delivery and for a non seamstress like me it would be a bargain at five times the price! Yesterday morning I facilitated an experimental nuno felting workshop at Clasheen but due to lack of water yet again have decided to put my own felting on hold until after the plumbers visit next Tuesday morning. It is a big pain (although I am grateful for the facility!) to carry all my water up the hill from my neighbour’s house so at the moment I am keeping consumption to a minimum. As blogged about at Clasheen my felting preparation at the moment is plotting and planning the shape of my first large felt sculpture of 2010. 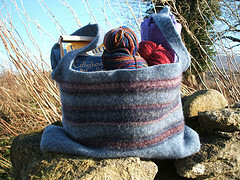 This left me free to warp my Ashford Knitters Loom again and have a bit of fun weaving a soft and tactile wallhanging. I warped the loom with a soft but strong natural cotton twine and then used cotton, thick and thin cotton yarn, undyed fleece, leather and found objects from the beach for the weft. It was great to be able to use some of my felting stash in a different way. The natural undyed fleece had been sitting in my studio for almost a year and a half just waiting for the right project but because there was not actually much of any one individual colour I had been procrastinating about what to felt with it. Warping only every second slot and hole allowed me to use these natural batts in the weft so now I am plotting and planning two bedside rugs, one in naturals and one in some of the gorgeous bright coloured Icelandic wool that I stock in my Etsy shop. Probably for the rugs I will use wool in the warp because I reckon that if I washed a fleece and cotton rug the wool might shrink and the cotton not and obviously for a bedside rug it would be nice to have the option of cleaning it in the future. Anyway, back to the wallhanging. Initially I wanted to include some found fishing net in the weaving but discovered that it was too difficult to push it into position so decidided to leave it out. Once I had finished weaving the hanging was shorter than I had hoped (my planning is not very good yet!) and I suddenly had the brainwave to insert the net through the space at the beginning of the work where I had placed some folded paper above the first few lines of weaving. Usually you remove this paper at the end of your project and the first few lines of weft from the bottom are then undone or cut off before tying or plaiting the warp ends to finish the piece. I decided to insert the net in the space and not to remove the bottom few lines of weaving, immediately the wallhanging became longer and the overall effect to my eyes looked a lot more balanced! I like the natural and organic feel of the hanging, no perfect tension and straight lines here. ‘Creative Weaving’ by Sarah Howard and Elizabeth Kendrick is an excellent book if anyone would like to see how I included the dried sea weed ends and the pieces of driftwood into the weaving as I went along. 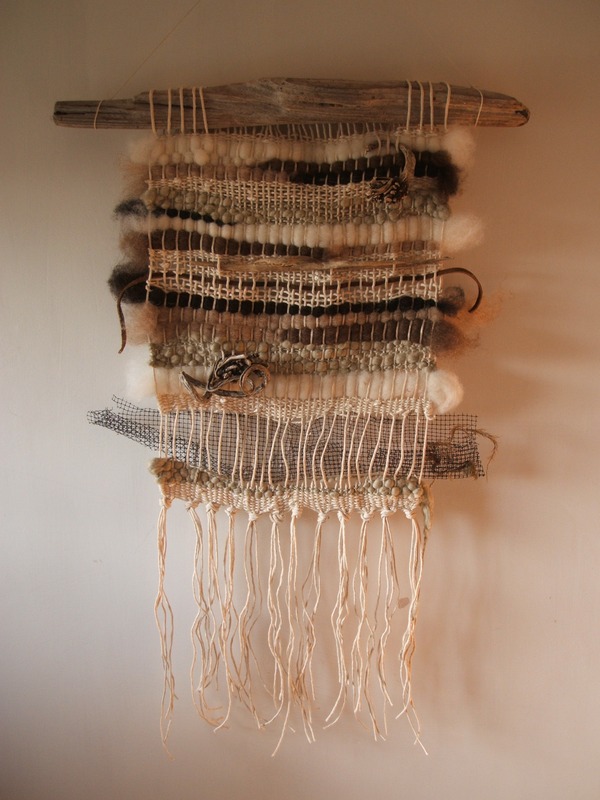 There are a couple more photos over on Flickr, now I just need to weave in a couple of the ends and drill some fittings to the back of the driftwood and my first woven wallhanging will be finished and ready to hang in my bathroom. Thanks, completed top and great swap package arrives! Wow, I’m blown away by the response to this new blog already and it’s only two days in existence. Thanks so much for all your lovely comments and messages of support, I hope that I don’t let you all down!!! The woven cropped top is now finished and here is a picture of the completed piece. I have had a question on Ravelry about how I stitched it together without cutting so here is the simple (hopefully!) explanation I posted in response. Fold the two ends together to form a large tube and stitch up just inside the fringe, this is the only sewing involved. Lay the folded fabric on your table, have a look at it and decide where you want the fringed seam to be positioned. The total width of mine was 91cms (it could have been wider but this was enough to work) when folded so I allowed an opening of 27cms on the upper side for my head, stitched approx 6.5cms seam on each side of this for the shoulders and then left the remaining approx 26cms on either side open to allow for the sleeves. When I had got that done I tried it on and decided how much to seam the bottom edge, just crochet it together and allow plenty of space around your middle for movement! When laid flat the shape is a perfect rectangle with the sleeves actually on the top line. This sounds strange but believe me it works and when you put it on it forms a simple batwing shape and drapes nicely under your armpits with a fluid line across the shoulders!! This would be a really fantastic project with some nuno felt or even two bought wraps stitched together along the top, it’s best if the fabric is drapable and not too stiff. Let me know if any of you try out the design and I am sure that we would all love to see some photos! Speaking of Ravelry check out this amazing swap package that I recieved yesterday from my Going Green swap buddy Gretchen! To see all the gorgeous goodies that are stored inside the upcycled bag and also to check out some detailed shots of the seaming in the cropped top have a look at my Flickr images. I have also just uploaded the large felted Irish landscape that I blogged about today on Clasheen to my Etsy store. This is a special opportunity to snag an experimental piece of felt which is perfect as it is or for those of you handy with a needle an ideal chance for some stitching and embellishing! Welcome to Clasheen Uncut and weaving a cropped top! Welcome to Clasheen Uncut. This new blog will run hand in hand with Clasheen, my online diary documenting life as a rural felter in Ireland! Here is the space where I will share all sorts of weekly trials and tribulations with you, felting, weaving, cookery, woodland managment, golf, travel and Irish country life in general. Clasheen will remain as always dedicated to my biggest textile love which is felting, Clasheen Uncut will give you a glimpse of my emerging textile or art related endeavors! I am not going to give you any speil about myself to start with here, all that may be found over at Clasheen. Suffice to say that since 28th December 2009 (due to unusually cold weather conditions here in Ireland) I have been living without central heating and water for almost all the time and my electricity and internet connection has been dreadfully patchy! As a result I have had to be inventive with my textile adventures. Felting requires water and believe me when you are gathering and melting snow to make a cup of tea embellishing and altering previously felted work combined with other textile disciplines come more to the forefront! My enforced absence from felting has had an up side, it has given me the time to try and get to grips with my Ashford Knitters Loom. 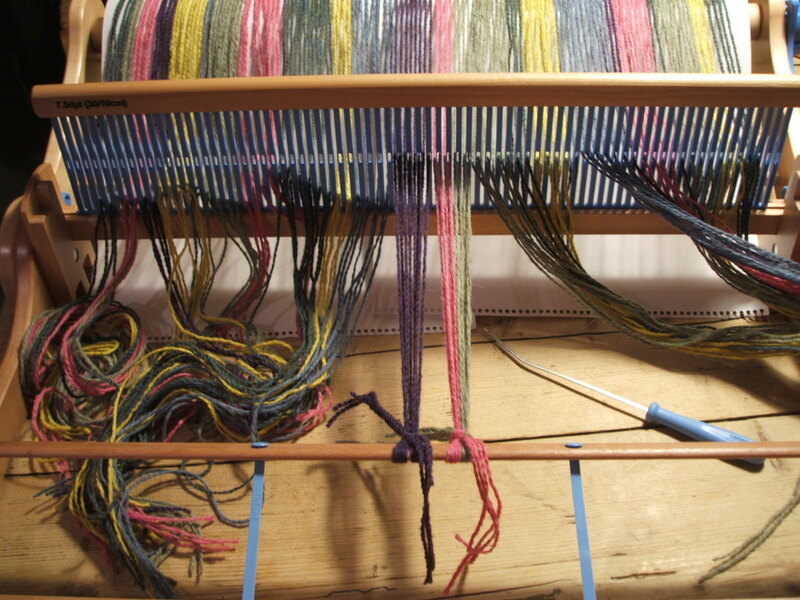 My first project was a dark purple and yellow scarf (photos on Flickr) and then I decided to try and warp the whole width of the loom, weaving is quick while I am finding that for me warping is time consuming. Warping the whole width gave me some freedom to practice my weaving and feel like I was actually creating a piece of ‘cloth’ as opposed to just a scarf. 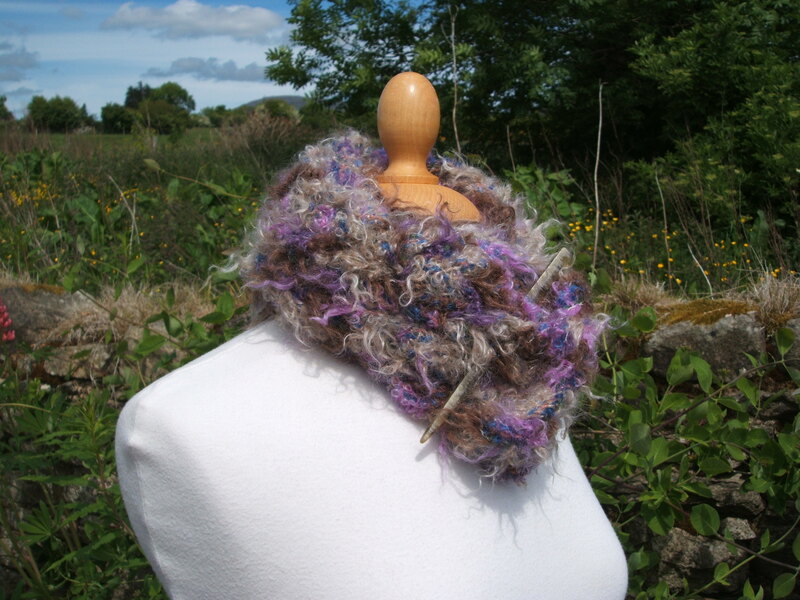 I adore scarves and am always creating them in felt but for my weaving I would like to create clothes and fabric to incorporate into my felting hence the wider warping width. Earlier in the year I felted a cropped top which was a prototype for an exhibition I wanted to submit for. Unfortunately I never got it together enough to actually expand on this shape but for my woven cropped top I had a couple of ideas in mind to try and put into practice. Those of you who have been following Clasheen over the last year and a half know how much I try and avoid sewing (and in fact any of the small finishing tasks that go to complete a project!) so I was thrilled to discovered how easy it is to crochet seams together with hand woven fabric, a whole new world has opened up to me! 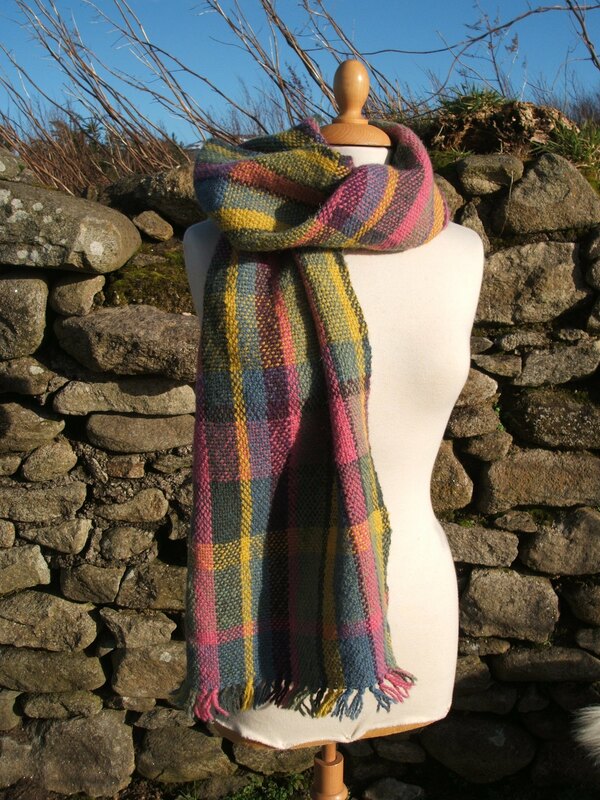 I named the cloth ‘Ella’ in memory of my grandmother as it is woven in some of her favourite colours, I can just see her throwing the fabric jauntily around her shoulders to ward off the cold. 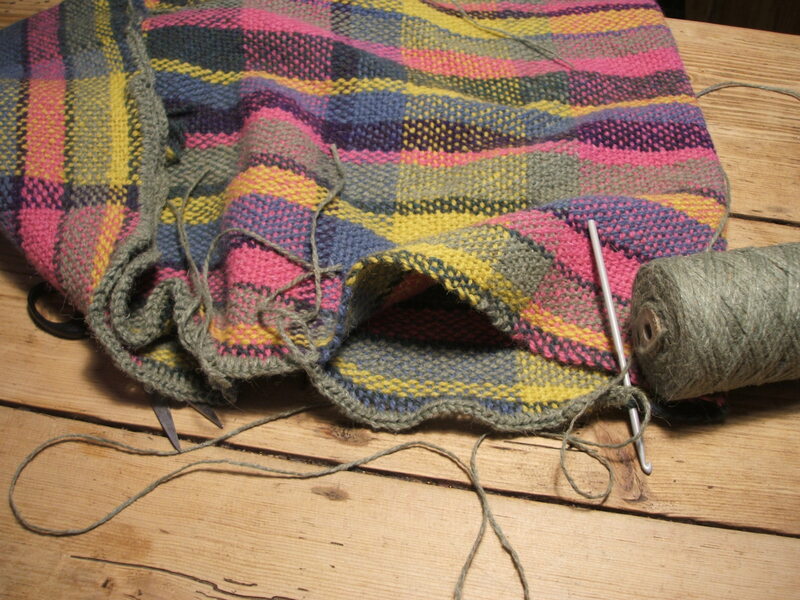 Here is an image of the top as I was seaming and finishing the edges. My next post will reveal the finished top but for now you can view some more images of the process to date over on Flickr!